In 2013, Dr Dornan AO spearheaded the Human Bionics Interface alliance at the International Bionic Conference in Melbourne. Dr Dornan then went on to found Bionics Queensland in 2016, which was incorporated in 2018. 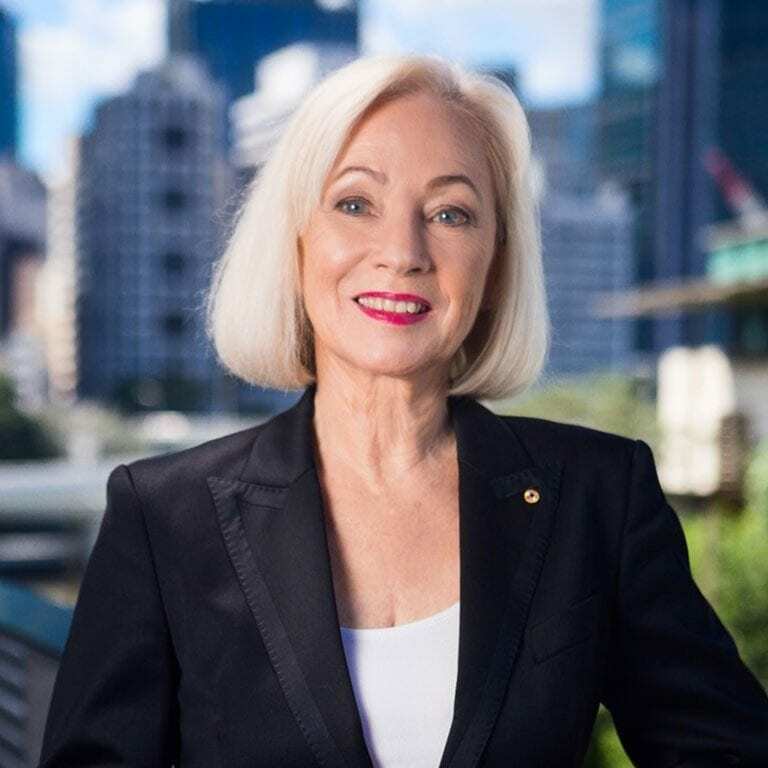 She endeavours to unite bionics projects across the state and nationally to ensure accelerated commercialised outcomes for both health consumers and scientists. Dr Dornan is also the founder and Executive Director of Hear and Say, a not-for-profit organisation providing hearing services for nearly 1000 children in Queensland, Australia. She has been widely recognised for her achievements with numerous awards e.g. inclusion in the Queensland Business Leaders Hall of Fame (2017) and Queensland’s Senior Australian of the Year (2018). Dr Robyn Stokes is Principal of Stokes Strategy and Research and widely recognised for her industry and academic experience in business strategy, research, marketing and the leveraging of major events. She has worked with CEOs and clients across industry sectors providing high level advice on business models, short and long term plans, research and stakeholder engagement. She is also a longstanding university academic (more recently in QUT’s MBA program). Her interest in life sciences, health and medical advances came to the foreground in preparing Brisbane and Queensland’s G20 leveraging strategies over 2013-14. Dr Stokes was the idea source for the Brisbane Global Cafe held alongside Australia’s G20. Dr Stokes joined Dr Dornan as co-chair on the Foundation Committee for Bionics Queensland in 2015. As a Board Director and Interim CEO of Bionics Queensland, she provides extensive input to strategies, business plans, the design and execution of major projects, the pursuit of funding and resources, marketing communication, stakeholder engagement and related research. Professor Gordon Wyeth was appointed as the Executive Dean, Science and Engineering Faculty at Queensland University of Technology in June 2014. Prior to this, Gordon held the position of Head of the School of Electrical Engineering and Computer Science and Professor of Robotics. Professor Wyeth’s main research interests are in spatial cognition and biologically inspired robotics, with more than 150 papers published in leading journals and conferences. Gordon is Chief Investigator in the ARC Centre of Excellence for Robotic Vision, and has received over $35 million in research funding from the ARC, government and industry. He has served as President of the Australian Robotics and Automation Association 2004–2006, chaired the Australasian Conference on Robotics and Automation in 1999, 2004 and 2011, chaired the IEEE Robotics and Control Systems Queensland Chapter 2010-2011 and is a Fellow of Engineers Australia. Shaun Drummond is the Chief Executive of Metro North Health and Hospitals. He has been Executive Director Operations since 2014 and has been a Chief Operating Officer in the Health Sector for 15 years. Shaun’s professional background is in Industrial Relations and Organisational Development. During his career he has worked in the public health system in New South Wales, Victoria, Queensland and New Zealand. As Principal of LA Mayes Law, Lesleigh focuses on the law and corporate governance relating to not-for-profits, charities and community organisations, including statutory bodies, corporations, and unincorporated associations, and trusts in health, housing, disability, religious orders, and industry associations. Matthew has a unique mix of professional and personal experience including an in-depth understanding of strategy, risk and cultural change from his almost 20 years as an environmental engineer in the energy and resources industry. Since 2012, Matthew has found many valuable and innovative ways to apply his knowledge and expertise after what began as a sore throat was diagnosed as toxic shock from Streptococcus A resulted which led to the loss of all four of his limbs. Matthew collaborates across numerous sectors, both domestically and internationally. He has found new ways to achieve independence being the first recipient of bilateral mind controlled bionic arms in the world. Matthew is involved in a variety of endeavors in the health sector. He is a board member of Hear and Say in Queensland and a member of steering committees for Queensland Health, the Australian Digital Health Agency and Bionics Queensland. With a strong business education and a diverse career in the government, commercial and healthcare sectors spanning 25+ years, Amanda has achieved success in project and change management, strategic/business planning, business policy/product development and public relations and marketing. In 2005, Amanda joined Queensland Health overseeing a $2B healthcare budget that included planning for finance and capital works and public affairs and communication. In 2007, Amanda undertook a business planning and development role for the project to construct the $1.5B Queensland Children’s Hospital at South Brisbane. Subsequently, she held executive roles in marketing, communications and engagement for the Royal Children’s Hospital, Children’s Health Service and the new Queensland Children’s Hospital Project. In 2012, Amanda established a small consulting firm providing business development solutions for government and private businesses and worked as Business Development and Operations Manager for Seasons Private Aged Care across South East Queensland. In January 2015, Amanda began her current role of Director of Sustainability and Strategic Relations at Hear and Say playing a pivotal role in enhancing charity’s long term financial sustainability, business and brand development.